France's Labour Minister has sent shivers down the spines of his compatriots after announcing that the country is a bankrupt state - in a radio interview on Sunday. Michel Sapin later rebutted the comment, saying it was a joke. Executive Director at DV Advisors, Patrick Young, doesn't see the funny side. There has been a lot said about a massacre at Aleppo, with both rebels and Syrian government blaming each other. 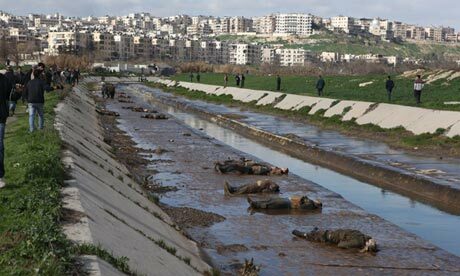 Rebel groups in Aleppo say they have recovered more than 100 bodies from a small river in the south of the city and say more are yet to be dragged from the water after what appears to be one of the biggest massacres to have taken place in the war-ravaged city. A video posted online today showed rows of bodies, most of them men in their 20s and 30s, with their hands tied behind their backs and evident bullet wounds to their heads. The graphic footage showed blood seeping from the corpses across silt left on the watercourse's concrete bank by floodwaters that have recently receded. One witness at the scene said he counted 108 bodies and rebel groups said they expected the final death toll to climb to as many as 120, though the Guardian was unable to independently verify the number of dead. The corpses were found on Tuesday morning in Bustan al-Qasr, in the southern city centre. The site is near one of several frontlines that divides opposition groups in the east and south of Aleppo from loyalist forces in the north. Where the men were executed is not yet clear. Winter rain has given the river a strong current in recent weeks and initial assessments suggested that the bodies could have been carried some distance. The Syrian regime blamed "terrorist gangs" for the killings, a term it uses for all groups fighting against it. A regime official in Damascus suggested that rebel groups were now leading a recovery in an attempt to "cover for their crimes". A Syrian official told Agence France Presse: "We will disclose the identities of those killed as soon as we are able to secure the bodies, which is a difficult process since the area is in the hands of terrorist groups." Rebel groups, however, blamed the Syrian government for the killings, suggesting that some of the victims had crossed into loyalist areas then disappeared. None of the victims had identification cards. Residents of rebel-held eastern Aleppo have reportedly arrived at the site where the bodies were found to try to identify missing relatives. The remains were loaded into trucks and taken to the nearby Zarzur Hospital, where rebel officials were trying to organise an identification process. A resident of rebel-held eastern Aleppo who called himself Omar al-Halabi told the Guardian that 11 bodies had been identified by nightfall and claimed by their families for burial. "Their relatives said that they live in ... areas under the control of the FSA like Ansari, Sukari and Al-Bustan districts," he said. "None were members of the Free Syria Army [FSA]. "I spoke to a guy who was able to identify his brother and his friend's bodies," he said. "[He] said that his brother and his friend were heading to one of the districts which are still under the control of the Syrian army in Aleppo and they did not come back three days ago. These two men were in their fifties. "Other bodies were identified by their relatives who said that they had been detained at the Air Force Intelligence headquarters in Aleppo 10 days ago." An eyewitness to the recovery effort said several bullets were fired during the day from buildings to the north. Extrajudicial killings have become increasingly frequent in many parts of Syria over the past six months. However, Tuesday's death toll in Aleppo is believed to be without precedent in the city since rebels launched an assault there in July. In the months since then, the opposition has entrenched itself in the east of the city and the regime has hunkered down in the north-west. The south-western suburbs of Saif al-Dawli and Salahedin remain battleground areas. Few residents cross the divide, which is manned on one side by Syrian soldiers and sniper positions and on the other by rebel groups. As fighting and atrocities continue, Syrian citizens are leaving the country in increasing numbers. Over the past six weeks, an extra 200,000 refugees have sought shelter in Lebanon, Turkey, Jordan and Iraq, the UN High Commission for Refugees said on Tuesday. More than 700,000 people have now fled Syria, the UN said, with 21,000 crossing into Jordan in the past week alone – about five times the number seen in previous weeks. The UN has appealed for $1.5bn (£950m) in aid to fund shelter, food and education for Syrian refugees but says it has so far been able to secure only 3% of that figure from international donors. With the violence in Syria showing no sign of abating, aid needs are likely to intensify in the first half of the year at least. At least another 1.5 million Syrians are believed to be internally displaced. While some food aid, as well as homegrown fresh produce, has been delivered to battle zones such as Aleppo in recent weeks, there is no guarantee that supply lines can continue to be secured. Fighting erupts near flashpoint areas of Aleppo most days. The site where the bodies were found is one such area, considered a no-go zone for the few remaining locals. 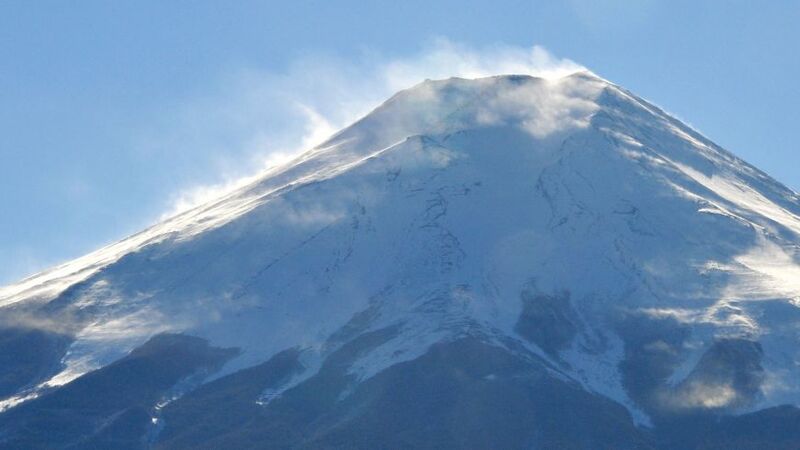 SHIZUOKA – An eruption of Mount Fuji could force some 567,000 people to evacuate their homes, according to a new estimate. The projection is part of an evacuation plan crafted by the Shizuoka Prefectural Government that also says more than 130,000 people, comprising some 50,000 households, would have to relocate if lava were to reach residential districts in the city of Fuji, which lies just south of the 3,776-meter mountain. Depending on the number and locations of vents, evacuation from wider areas could be needed. The plan is based on a hazard map prepared by the central government based on Fuji’s last eruption, in 1707. Under the evacuation plan, 10 zones have been designated at the foot of the mountain based on the expected direction of lava flows. The plan specifies evacuation zones in four grades. The Yamanashi Prefectural Government is preparing a similar evacuation plan. (Weather Underground) – The calendar says it’s January, but the atmosphere looks more like April over the Midwest U.S., where a spring-like surge of warm air is interacting with a strong low pressure system to create a dangerous severe weather situation. The warm air surging northwards has already broken high temperature records for the date in Chicago, where the mercury hit 61°F [16°C] at 7 am CST; a tornado watch is posted for portions of Texas, Oklahoma, Kansas, and Arkansas. Golf-ball sized hail fell at three locations in Oklahoma already this morning, and a wind gust of 75 mph was reported in a thunderstorm near Omega, Oklahoma. NOAA's Storm Prediction Center has placed portions of Arkansas, Louisiana, Texas, Tennessee, Missouri, Alabama, Oklahoma, Illinois, Indiana, and Mississippi in their "Moderate Risk" region for severe weather on Tuesday. 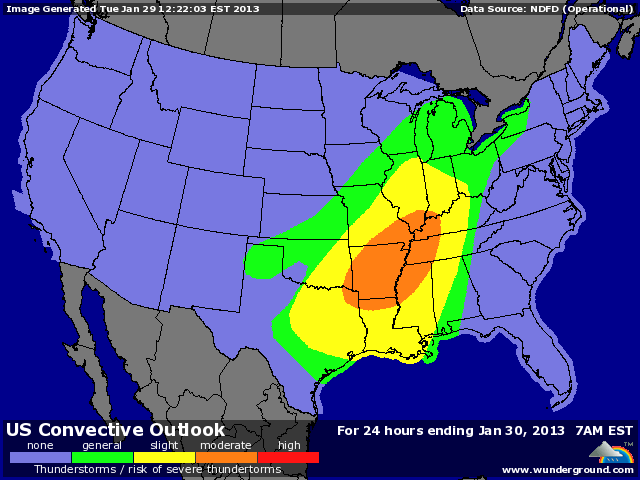 This is the first "Moderate Risk" forecast issued during 2013. The primary threat will be damaging thunderstorm winds, but we will also see tornadoes, with the potential for a few strong EF-2 and EF-3 twisters. The surge of warm moving northwards ahead of the cold front spawning today's severe weather is bringing in warmth unprecedented for January in some locations. Monday was the hottest January day on record in Topeka, Kansas, which hit 77°F [25°C]. That's 36°F above average. and 3° warmer than their previous highest January temperature. Columbia, Missouri tied its all-time warmest January temperature, 77°F [25°C]. Kansas City (74°F [23.3°C]) and Wichita (74°F) both fell 1° short of tying their all-time January hottest temperature records. Balloon soundings of the atmosphere taken last night showed moisture levels in the top 5% for a January day over much of the Midwest, and several stations may set all-time rainiest January day records today. One candidate is Flint Michigan, where a heavy thunderstorm moved in at 7:30 am, dumping 0.75" of rain. With another round of thunderstorms expected tonight, Flint is poised to break its record for rainiest January day in its history--the 1.34" that fell on 18 January 1949. Powerful winds and a tornado spawned by a 1,000-mile-long storm system pounded communities in northwest Georgia on Wednesday, overturning dozens of vehicles and trapping residents. The tornado caused significant damage in Adairsville, Georgia. One person died in that town and another died in Tennessee, authorities reported. At least 17 people were injured in Georgia, two critically. The Adairsville death marks the first person killed by a U.S. tornado in 220 days, a record for most consecutive days without such a fatality, said CNN meteorologist Dave Hennen. The storm churned eastward, prompting severe thunderstorm and flash-flood warnings in eastern Tennessee and western portions of the Carolinas. The front has led to nearly 400 reports of severe wind and 20 of tornadoes over two days, from Texas to Pennsylvania. In the Adairsville storm, winds caused significant damage to a motel and a manufacturing plant, according to Craig Millsap, fire chief and interim emergency management director for Bartow County. The motel's guests are believed safe and workers at the Daiki plant have all been accounted for, he said. Daiki employees hid in a kitchen and bathroom as the tornado snatched the roof off and left much of the plant in ruin. Two workers suffered minor injuries. The driver of a commercial truck that was overturned near Adairsville said the storm "grew legs and just started accelerating." He told CNN Atlanta affiliate WGCL he was unscathed. "There is no way in the world that if you see this debris behind me I should be alive." The National Weather Service reported major structural damage and overturned cars in downtown Adairsville, where a news crew for CNN affiliate WSB-TV witnessed a tornado form and touch down Wednesday morning. The death came when a building collapsed, Millsap said. Officials reported up to 100 homes damaged in Bartow and Gordon counties. Georgia emergency officials reported eight injuries in Gordon County, north of Adairsville. Two of the injuries were described as critical. "There have been a number of entrapments and deputies, firemen and emergency personnel have all been working to free those people," said Gordon County Chief Deputy Sheriff Robert Paris. "I don't believe we have any more trapped at this time." The tornado struck a subdivision that also was hit by storms in 2011, Paris said. "This one appears to be much, much worse. But this was almost the same path. There were some people that had to go through both of them." Gov. Nathan Deal declared a state of emergency for both counties. State officials late Wednesday afternoon said they had no reports of anyone unaccounted for, but searches of homes and businesses were continuing. Trees and power lines were down as the result of a possible tornado in Georgia's Gilmer County, the weather service said. In Tennessee, a 47-year-old man died early Wednesday when high winds toppled a tree onto a roof in Nashville, the Tennessee Emergency Management Agency said. CNN affiliate WSMV said the victim was in a building next to a home. Other injuries were reported in Chester, McNairy and Henderson counties, emergency management spokesman Jeremy Heidt said. The National Weather Service also reported severe weather or damage Wednesday in Texas, Mississippi and Alabama. Tornadoes were confirmed in Marion County, Kentucky, and Harrison County, Indiana. Northern Florida, eastern Georgia, much of South Carolina and portions of North Carolina, Virginia and Maryland were under a tornado watch Wednesday evening. CNN meteorologist Chad Myers said the massive storm system was 1,000 miles north to south, moving east in a belt that will eventually stretch from New York to Florida. "If it's hot and humid where you are, then you are still in the danger zone," Myers said. "Storms can still be coming to you tonight. ... The cold air is on the back side of it." The strong cold front causing the severe weather brought huge extremes in temperature readings. Thermometers reached the low 80s in parts of southeast Georgia and South Carolina, the 50s in Tennessee and the 30s in Illinois. Earlier, in Alabama, the storms blew the metal roof off a building in Sheffield, CNN affiliate WHNT said. The storm also damaged a church steeple in Rogersville, the station reported. In Kentucky, winds blew off much of the roof of the Penrod Missionary Baptist Church and damaged several homes, CNN affiliate WFIE reported. In Nashville, the weather service listed dozens of damage reports across the region: a funnel cloud was reported early Wednesday in Jackson County, there were dozens of reports of downed trees and power lines, and law enforcement reported damage to homes and businesses. CNN affiliate WSMV also reported the partial collapse of an office building in Mount Juliet. "I built it myself to take an event like this. And it looks like a freight train hit it," the station quoted building owner Dewey Lineberry as saying. "It's just destroyed. It laid the building down on top of cars, it put the building on top of people. It's unbelievable." Workers who were inside the building when the storm hit took cover under mattresses, the station said. The storm came dangerously close to WSMV, the station reported: Workers had to move to a safe room when a buzzer in the newsroom alerted them of storm danger around 4 a.m. Wednesday, the station reported. CNN iReporter Matt Davis said overnight storms damaged a historic brick structure on Fairvue Plantation in Gallatin, Tennessee. "The plantation was a horse farm. Those (structures) have been standing there for 100 to 200 years. It was sad to see those collapsed and caved in. It's historic to the neighborhood," the high school student said. On Tuesday, the storms raked Arkansas, Louisiana and Mississippi, among other places, with heavy rain and high wind. A 50-year-old woman in the city of Copiapo died of a heart attack, said Atacama Regional Governor Rafael Prohens, who attributed her death to fear during the quake. Authorities said that damage was limited and discounted the possibility of a tsunami. 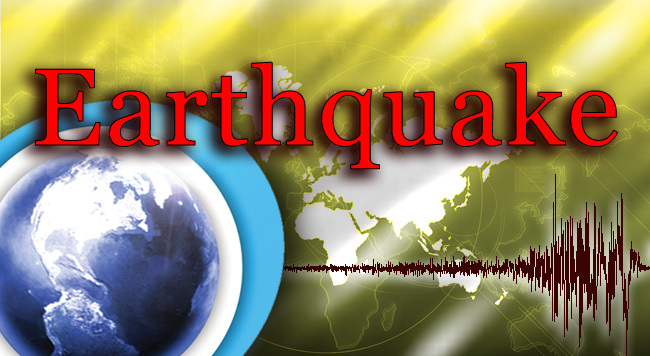 The U.S. Geological Survey originally reported the quake at 6.7, but later revised it upward. It struck at 4:15 p.m. (3:15 p.m.; 2015 GMT) and was centered 27 miles (44 kilometers) north of Vallenar, Chile. 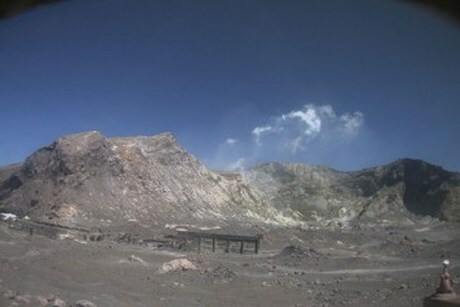 The hot crater lake on White Island has now completely dried up as explosive rocks, mud and gas continue to be thrown into the air from the active volcano. White Island has been spewing a steady stream of gas since activity heated up in December. It's the most active the volcano has been since 2000. GNS Science vulcanologist Brad Scott said a "small tuff cone" was forming on the bottom of the crater lake, and the active vent was producing "vigorous bursts" of mud, rock, steam and gas up to 100 metres into the air. "GNS Science's past monitoring of the island shows that new eruptive episodes often develop out of this type of activity," Scott said. "Small muddy lakes sometimes form in craters. As the unrest develops geysering and explosions occur through these lakes, becoming more vigorous with time." He said the activity did not necessarily mean an explosion or full-scale eruption would happen, although one could at any time. Even though there was an elevated risk to tourists on the island, conditions weren't so dangerous that people could not travel there. Tourism has, in fact, been booming at White Island as the volcano heats up, with visitors eager to see some explosive action. Frontier Helicopters is one of three helicopter tour operators which fly around the island. Owner Mark Law said there had definitely been a greater interest in the activity from visitors lately. "It is our busy season, so it's a little hard to gauge whether or not more people are coming to visit the island because of it, but there is a greater awareness about the island from tourists, definitely," he said. Law said company worked closely with GNS to assess the safety and in a worst-case scenario – a full scale eruption – it would simply mean they would not be able to fly as close. "The only thing is, if it gets to any serious level of activity there's an exclusion zone which we operate by, because you can never tell just how far it will throw rocks," Law said. At this stage, it was still possible to get reasonably close to the crater. One of the pilots from Frontier was able to get about 180 metres away to film some spectacular footage of the explosions on Monday. January 31, 2013 – OREGON - A magnitude 5.3 earthquake struck about 170 miles off the southern Oregon coast. The National Weather Service’s West Coast and Alaska Tsunami Warning Center said there was no danger of a tsunami from the Tuesday evening quake. There were no immediate reports of damage. The U.S. Geological Survey’s National Earthquake Information Center in Golden, Colo., said the 7:14 p.m. PST quake occurred at a depth of 6.4 miles. By 10 p.m., the center’s website had logged four reports from people who said they felt a weak shaking from the quake. In the last 12 months, the number of quakes erupting off the coast of Oregon has been moderately increasing.